This half of the island is populated with Wolfweres disguised as humans. Talk to Palin. He asks you to help some people being attacked by monsters to the east. Follow him and you will be attacked by Wolfweres (including the ambush-setting Palin). Return to Farthing with her doll in Isle of Balduran [South]. Meym will approach you and warn you away from the shipwreck. Talk to him again and he will attack. Kill him. The Sirine Queen will hail you. Demand the return of Evan. She has already killed him and hints at him not being human. She will attack with some Sirines. Kill them. Retrieve Evan's body and return to Evalt in Isle of Balduran [South]. Alternatively you can say "I am [PC's name]...", "You did what..." options 3, 1 and she will give you the body without a fight. Kryla will approach you. She wants you to avenge her dead son who is not at all dead. They will attack you. Kill them. Enter the house AR1505. Talk to Dradeel. He tells you about the events following the shipwrecking of Balduran. If you threaten to steal his spell book for yourself, rudely refuse his quest or are generally impolite he will attack. Otherwise agree to retrieve the book from the 4th deck of the Shipwreck. He will give you an amulet to aid your cause. You can rest in his house. On your return give him the book and he will teleport out. You can then raid the locked chest and desk in his house. Return the cloak to Durlyle / Delainy in Isle of Balduran [South]. Enter the 1st deck of the shipwreck AR1501 through the breached hull. Kill the Dread Wolves and Wolfwere. Go up the stairs to the 2nd deck AR1502. Kill the Vampiric Wolf and Wolfweres. Go up the stairs to the 3rd deck AR1503. Kill the Vampiric Wolves and Wolfweres. Go up the stairs to the 4th level AR1504. Karoug will hail you and say that the real villains are the villagers. Question his need for Peladan and he will attack. Kill him, Daese and the other Wolfweres. Be sure to collect Peladan, the Log Book of Balduran and Dradeel's Spell Book for the other quests. Bewarned that there is a trap in front of the big desk. Leave the wreck to speak to Kaishas in Isle of Balduran [South]. When you finally return to this part of the island via the Werewolf Caverns head to Kaishas' ship in the cove. She will hail you then transform into a Loup Garou. Kill her. 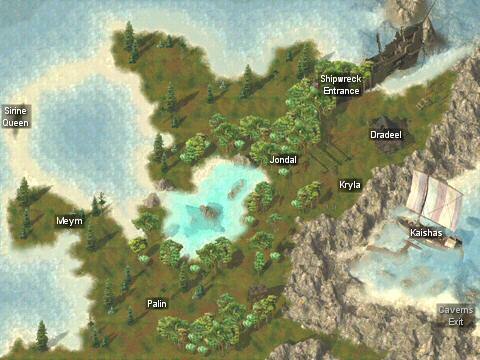 Retrieve the charts and click on the mast to set sail for Ulgoth's Beard and Mendas. Raid the trapped barrel and stash hidden in a beam at x 209 y 505. Raid the trapped barrel, locked chest and trapped and locked chest. Raid the two trapped cannonball crates and the stash hidden in a cannon at x 350 y 494. Raid the trapped and locked chest and the desk. Collect Peladan from Karoug on the 4th deck of the Shipwreck (assuming Karoug is dead) and return the child to Maralee in Isle of Balduran [South].